iHEARu HELPS YOU MAKE SOUND DECISIONS. LOOKING FOR A RESTAURANT WHERE DEAR OLD MOM CAN HEAR YOU ON HER BIRTHDAY? LOOKING FOR SOMEPLACE LOUD ENOUGH TO RELEASE YOUR INNER CHILD? LOOKING FOR A PLACE TO IMPRESS THE BOSS WITH YOUR LATEST PITCH? LOOKING FOR A QUIET PLACE TO HAVE A CONVERSATION? We live in a noisy world and so we created iHEARu to help you make sound decisions. Do you want to find a quiet cafe to discuss business or chat with a friend? On a specific day and time? iHEARu can help. Our mobile app uses crowd-sourcing to help you find locations with noise levels that suit your needs. If you're looking for a quiet eatery, bar or cafe then iHEARu GPS will help you find it. If you're looking for public or commercial spaces that offer assistive listening options, our mobile app can locate those too. Like it Loud? That's okay too. 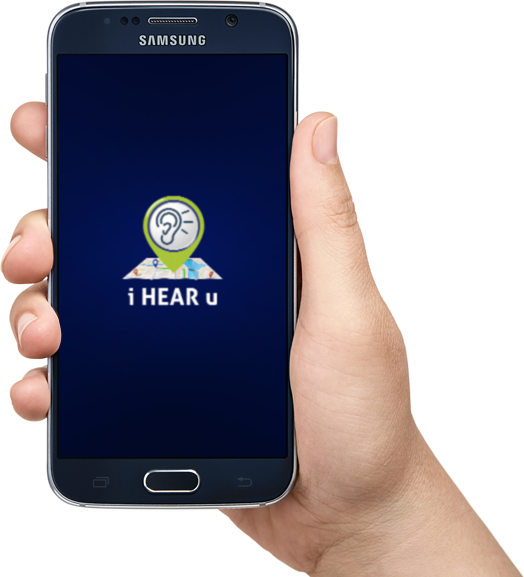 iHEARu provides you with that information in advance so you can decide if you want to bring hearing protection. Wherever you go in the world, iHEARu users can search for ear-friendly restaurants, theaters and more. Join our team and map the world! What does the iHEARu app do? iHEARuuses GPS to locate public and commercial establishments and provides user-generated loudness ratings so you can decide which sound environment is best for you. Everyone can use iHEARu to locate "ear-friendly" locations but if you want to provide your own review of a location, you'll need to register. What does the "ear" symbol mean? The ear icon refers to "ear-friendly" places. Any location that shows an average of 4 noise bars or less are designated as "ear-friendly". You also have the power to designate places as "ear-friendly" by letting people know about establishments where the owners/staff don't mind turning the volume down. Establishments that offerassistive listening systems can also be labeled as "ear-friendly". How does the rating scale work ? iHEARu's color-coded bar displays quietest levels at the left (yellow) and the loudest at the right (red). The microphone on your phone picks up the sound and converts it to a value that is displayed as a color on the bar scale. Sound levels are estimates. They are reliant on the type of phone you are using and how you're using it to make sound measurements. So, please do not rely on these ratings when determining safe listening levels over specific periods of time. Instead, please consult the following websites for hearing prevention information. Why do you want to know what my ears say? The microphone measures provide numbers that describe decibel levels, but everyone has different hearing abilities and different preferences. So,iHEARu users also have the option to provide their own ratings in two ways: "what my ears say," as well as the comments section. Do I have to write a review? Ratings are optional. But, for iHEARu to display a good example of an establishment's typical sound level requires many users to submit their own sound-level impressions. Your opinion is important, so we invite you to write a review and share it with others. But that is completely optional. What kind of reviews are helpful? The possibilities are endless. You could describe which table you think is the quietest in the restaurant, or even take a photo so a person can request that table when making a reservation. You could identify a theatre that has assistive listening devices that can help you hear the concert or play. How do I change the radius of the search? Go to the "Settings" option and use the slide bar to change your search range. Can I find a location in another city? Yes. Plan your business meeting in advance by finding a quiet meeting place/coffee shop in San Francisco, Paris, Sydney or Toronto. You can search a location remotely by typing in "restaurants near Fisherman's Wharf San Francisco"
What do I gain out of using iHEARu? By participating with iHEARu you help other customers such as yourself who will be looking for similar places to have fun, do business, hear someone or be heard. How do I tell people if there's a restaurant or location that will turn down the volume if asked? Just ask. You'll be surprised how many establishments are eager to please. How do I let people know there's a quiet area in a restaurant or a table that has good light for seeing what people are saying? Enter supplemental information in your review and/or add a photo. Where can I learn more about the hazards of listening to loud noise? A lot of information can be found on the web, but here are a few links to get you started. Why doesn't the ME pin show me in the correct location? GPS isn't perfect. Try manually entering your location by address or establishment name. If you're in a shopping mall or location with multiple floors, save as "other" and type the establishment name in the comment box. How can I learn more about the establishment I'm going to? If you click on "view more details",you'll be able to visit the establishment's website if they have one active. In some cases you can see the menu and hours of operation. How are microphone ratings determined? iHEARu's sound level measurement module was evaluated/tested in collaboration with NIOSH researchers and is in accordance with the methodology outlined by NIOSH researchers (Kardous and Shaw 2014). http://scitation.aip.org/content/asa/journal/jasa/135/4/10.1121/1.4865269. Why do decibel levels vary from phone to phone? Sound levels can vary depending on the way you hold and use your phone. They will also vary depending on the type of phone you have. So, you can choose not to rely on the microphone level and use the personal rating instead - "what my ears say". Does iHEARu record what I'm saying? No. Only sound pressure level is measured and displayed. The words that are spoken are not stored in any way. iHEARu's mission is to enhance social and communication opportunities for all. We are advocates for healthy hearing and have developed this tool as a way to create change. Together we can create and access ear-friendly spaces.